NO WAITING FOR CERTIFICATION CARD TO BE MAILED!!! Educational Critical Care Concepts is an American Heart Association Training Center headquartered at The Commons in Windham NH. Classes in Massachusetts are performed onsite at facility locations. Additionally, we have training sites located at Parkland Medical Center in Derry NH and Portsmouth Regional Hospital in Portsmouth NH. We provide Heartsaver First Aid, CPR, Basic Life Support (BLS), Basic Dysrhythmia, Advanced Cardiovascular Life Support (ACLS) and Pediatric Advanced Life Support (PALS) training to the community and healthcare providers that are in need of new certification and re-certification in accordance with the American Heart Association (AHA) guidelines. All courses are instructed in either a traditional classroom format or in a Blended eLearning format. Classroom component is conducted online as a self-directed program. Once the online component has been completed (including the written test), the student comes in to our training center for a hands-on skills practice/testing session. 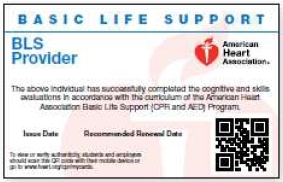 All of our courses are American Heart Association courses and successful completion of course results in an American Heart Association course completion eCard that is recognized nationwide. Employees of Portsmouth Regional Hospital, Portsmouth Regional Ambulatory Surgery Center, Parkland Medical Center (Derry, NH), and Steward Health Care Systems, LLC (Holy Family Hospital - Methuen, MA & Andover Surgery Center) please use the Employee Enrollment Form located on the top of this page or CLICK HERE! In keeping current with current technology, Educational Critical Care Concepts has outfitted all of our training locations with new ECG Simulators! These state of the art simulators are for use in ACLS/PALS classes to enhance the students learning experience. These simulators are used with pre-set practice scenarios and AHA Megacode scenarios for testing. With new simulators, students will monitor vitals including temperature, heart rate, SPO2, ETCO2, Xrays & capnography. 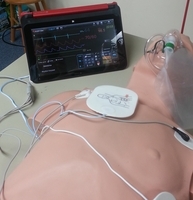 Additionally, with the touch screen, students will be able to check NIBP, charge and use defibrillator, perform synchronized cardioversion, perform transcutaneous pacing and much more. We are pleased to announce the American Heart Association has partnered with the Society of Cardiovascular Patient Care and share in their mission for chest pain care and Early Heart Attack Care (EHAC). For more information regarding EHAC, please follow this link to their website. Our Director of Education/ Training Center Coordinator is a very active participant in the American Heart Association. 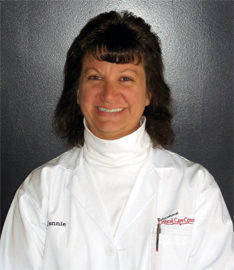 She brings 25+ years of nursing experience in emergency healthcare working in the New England area, specifically southern NH and the Boston, MA area hospitals. She is an experienced educator, is an American Heart Association BLS, ACLS & PALS Regional Faculty Member for Northern New England and member of the Northern New England American Heart Association QA/QI Sub-committee.. Our emphasis is on performing all classes in the most comprehensive manner for the best possible quality training for all participants. Our instructors are experienced healthcare professionals and emergency medical responders who are active in the field and have first hand experience with codes and emergency situations. In all of our classes, each participant is required to actually demonstrate their skills. Each participant has their set of equipment for practicing and demonstrating all aspects of life support on their manikin. Each participant has their own workspace where they perform hands-on-practice on the table top, no practice will be performed on the floor, eliminating knee and back fatigue, unless of course that is what you prefer. While we do realize that in reality, we take care of the victim wherever they may fall; in the classroom, participants practice on the table top to alleviate any distractions from discomfort and focus on skills application. 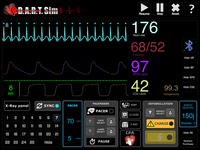 Educational Critical Care Concepts uses up to date new equipment including brand new Instrumented Real-Time Directive Feedback Manikins programmed to the new 2015 AHA Guidlines. Other new equipment includes touch screen simulators that provides instant patient feedback for advanced classes. Additional training equipment includes Saniman Adult manikins, Baby Anne infant manikins, adult/infant BVMs, one way valves, Heartstart FR2 AED trainers, Adult ACLS manikins, defibrillators, advanced airways and more. Each participant uses their own equipment without the need to share. All equipment is sanitized after each class. Participants will breath into the manikins using their pocket masks, BVMs, will perform actual chest compressions, use their AED trainer to attach to their manikins and perform simulated shocks, install advanced airways, connect/use defibrillators and administer drugs (no actual drugs used) with actual commercially prepared packing (medications have been replaced with water). 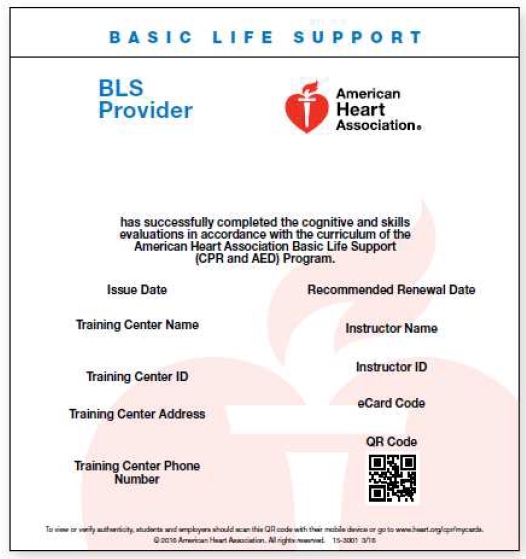 "The goal of Educational Critical Care Concepts is to provide a quality First Aid/CPR/BLS/ACLS/PALS educational service to the community and healthcare professionals that meets the requirements of the American Heart Association (AHA)guidelines while streamlining the certification process required by hospitals, doctors and the needs of the community". "We provide dedicated Training Centers, that offer FLEXIBLE scheduling of courses to meet the needs of the community."